Many of our fur folks are indeed reflecting our own personalities, strengths, weakness, and environments. They are true mirrors to both our daily and deep soul needs and desires. Personally, I am communicating with more and more animals that are clear reflections of their people. For myself, I had (and still experience!) a wonderful cat named Rocky who was my teacher and mirror for many things. 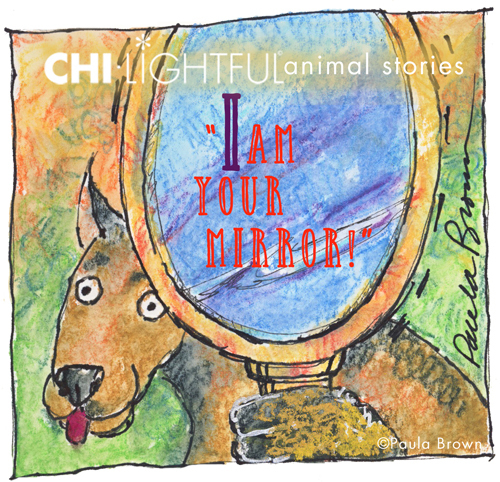 Mirror animals both show and absorb who we are! For instance, I had a tooth issue with some inflamed gum areas that was causing a great deal of discomfort. Rocky cat went in for an acupuncture session and with a general physical exam, it was found that he too had the same area inflamed and had to have the tooth removed. Totally reflecting my “issue” in the physical. Many animals develop the same “dis-ease” their people have. One very nice client of mine was suffering from a long time bone Cancer…so was her loving cat. And, fur folks reflect and absorb our emotional imbalances too! Calls from people with pets that are not eating, sleeping well, etc. are in some cases taking on their people’s stress and showing their loved ones that “something is not correct”. More and more I am suggesting to people to very much “see” what their animals are showing us all. We can heal both them and ourselves much quicker when we spot things being reflected back from our fur folks. Their job is to SHOW us who we are and what we are doing. As we find out what our pets are telling us, it is great to mimic the treatments they need and applying them to our own lives. Flower essence treatment for emotional issues are great to share and match when an animal can benefit from some lovely balancing. So, look into your pet’s “looking glass” and find love, support, revelations and healing from both their physical and emotional clues they are there to give you! This entry was posted in Blog Archives, Recent Posts and tagged Animals as "mirrors". by Paula Brown. Bookmark the permalink.